Fortiseode pervalimand, from Jia et al. (2011). Contains: Geocharis, Scaritinae, Elaphrinae, Conjunctae, Trachypachini, Carabinae. The Geadephaga is a lineage of terrestrial, mostly predatory, adephagan beetles supported, albeit weakly, by molecular analysis. Most Geadephaga are classified in the large and diverse family Carabidae; classification within the Carabidae has historically been confused with authors differing substantially in their preferred arrangements. Authors have also differed on whether groups such as Trachypachinae and Cicindelinae should be included within Carabidae or treated as separate families. The Mesozoic Eodromeinae have mostly been included in a family Trachypachidae with the Trachypachinae but a phylogenetic analysis by Beutel et al. (2013) placed at least some eodromeines outside the geadephagan crown clade. A similar position was occupied by the Jurassic Timarchopsis aquaticus, previously classified in the extinct dytiscoid family Coptoclavidae. 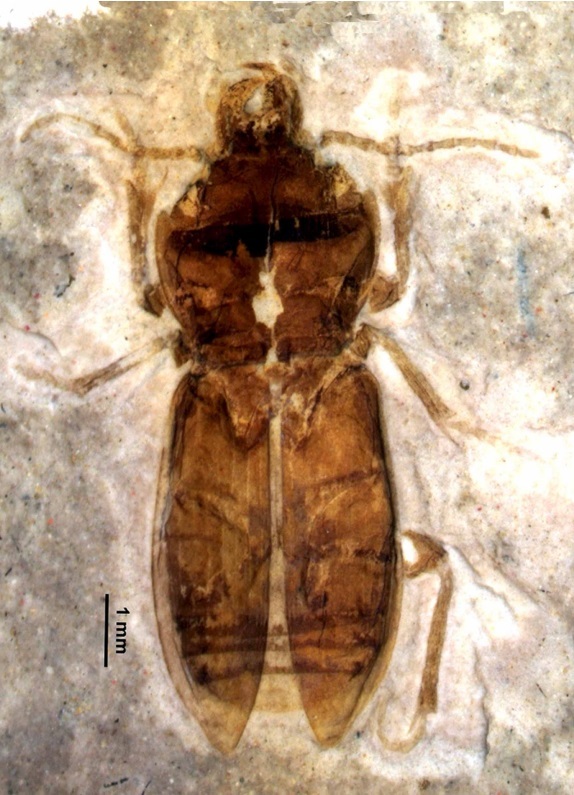 Sogdodromeus of the Triassic of central Asia is among the earliest of all known Adephaga (Lawrence et al. 1987). Ademosynoides asiaticus is even older, from the Late Permian or earliest Triassic of Siberia, but its inclusion in the Eodromeinae is more questionable (Beutel et al. 2013). Fortiseode pervalimand from the Later Jurassic to Early Cretaceous Yixian Formation of China, originally classified as an eodromeine, was placed by Beutel et al. (2013) within the carabid crown group. [AM07] Acosta, L. E., & G. Machado. 2007. Diet and foraging. In: Pinto-da-Rocha, R., G. Machado & G. Giribet (eds) Harvestmen: The Biology of Opiliones pp. 309–338. Harvard University Press: Cambridge (Massachusetts). [AT01] Arnett, R. H., Jr & M. C. Thomas (eds) 2001. American Beetles vol. 1. Archostemata, Myxophaga, Adephaga, Polyphaga: Staphyliniformia. CRC Press: Boca Raton. [B89] Bates, H. W. 1889. Viaggio di Leonardo Fea in Birmani e regioni vicine. XVI.—On some Carabidae from Burma collected by Mr. L. Fea. Annali del Museo Civico di Storia Naturale di Genova, Serie 2a, 7: 100–111. [BW13] Beutel, R. G., B. Wang, J.-J. Tan, S.-Q. Ge, D. Ren & X.-K. Yang. 2013. On the phylogeny and evolution of Mesozoic and extant lineages of Adephaga (Coleoptera, Insecta). Cladistics 29 (2): 147–165. [E04] Emberson, R. M. 2004. A European ground beetle, Harpalus tardus (Panzer) (Coleoptera: Carabidae), in Canterbury, and the predisposition of European carabids to establish in exotic temperate locations. New Zealand Entomologist 27: 39–42. [L98] Lafer, G. S. 1998. Supplementary accounts of the ground-beetles fauna (Coleoptera, Carabidae) of the Southern Kuril Islands. Far Eastern Entomologist 59: 19–20. [MC94] Morrone, J. J., & J. M. Carpenter. 1994. In search of a method for cladistic biogeography: an empirical comparison of component analysis, Brooks parsimony analysis, and three-area statements. Cladistics 10: 99–153. [R02] Rasnitsyn, A. P. 2002. Scope and approach. In: Rasnitsyn, A. P., & D. L. J. Quicke (eds) History of Insects pp. 1–8. Kluwer Academic Publishers: Dordrecht. [R-JC01] Roig-Juñent, S., & A. C. Cicchino. 2001. Chaltenia patagonica, new genus and species belonging to Chalteniina, a new subtribe of Zolini (Coleoptera: Carabidae). Canadian Entomologist 133: 651–670. [SA04] Serrano, A. R. M., & C. A. S. Aguiar. 2004. Three new species of the genus Geocharis Ehlers, 1883 from Portugal (Coleoptera, Carabidae). Graellsia 60 (1): 71–80. Last updated: 10 November 2018.